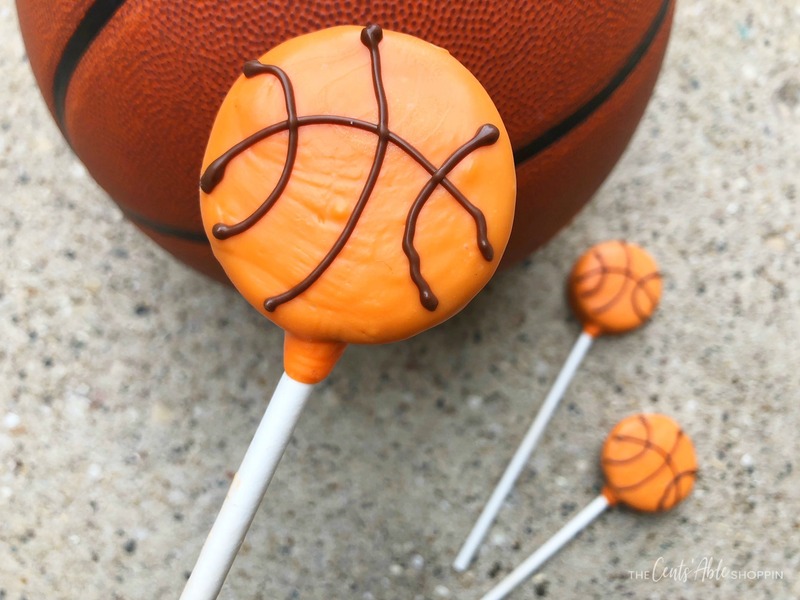 Yummy Basketball Oreo Pops – the perfect way to celebrate a successful season or a delicious treat to serve at game time! I haven’t quite met anyone who doesn’t enjoy a good Oreo cookie – they are indeed as addictive as they are delicious. Am I right? Dipped in a second layer of sweetness makes them even more of an incredible experience. If you have kids in basketball and are celebrating a successful season, or.. perhaps having a gathering to watch the NBA finals, then these are definitely the thing to serve. They hit just the right sweet spot on every way: a cookie wrapped in a delicious chocolaty layer and enjoyable in a single bite. Not that I’ve stuck the entire thing in my mouth in just one bite or anything but… I’ve definitely felt like doing it. 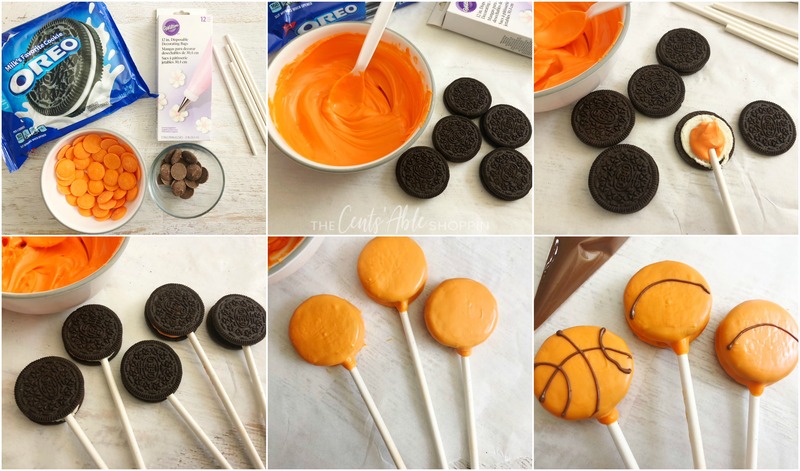 Throw these Basketball Oreo Pops together for the team and you’ll be the the most popular parent or friend around. Everyone will think you splurged at your local bakery without even realizing you did these yourself. Now lets get started – shall we? You should be able to find everything you need at your local grocery store (if not Walmart). First, you’ll want to cover your surface area by laying a piece (or two) of parchment paper onto a baking sheet. Pour out your candy melts in a microwave safe bowl – heat them on 50% power in the microwave. It’s best to melt them in 20-30 second intervals, taking time to stir thoroughly in between. Candy melts can melt quite fast so don’t go too far. Open each Oreo and dip the end of each lollipop stick heavily into the melted chocolate. Then carefully (and quickly) stick it into the Oreo white filling. After placing the stick within, scoop a tiny bit of extra melted candy into the center, then push the cookie back together. Let the cookie harden for a few minutes; then hold the stick and (carefully!) dip the Oreo into the melted chocolate. Give the Oreo a minute to drip off any excess (otherwise you’ll have a mess on your hands!) Place the Oreo pops onto the parchment-lined baking sheet and transfer to your freezer for 10-15 minutes. Now, take the brown candy melts and melt them in the microwave at 50% power, taking time to stop and stir every 20-30 seconds. It’s safer to melt them at intervals like you did previously, as they can burn rather quick. Pour the brown candy melts in your candy decorating bag and carefully draw the basketball lines on the Oreos. Let harden for 10-15 minutes. 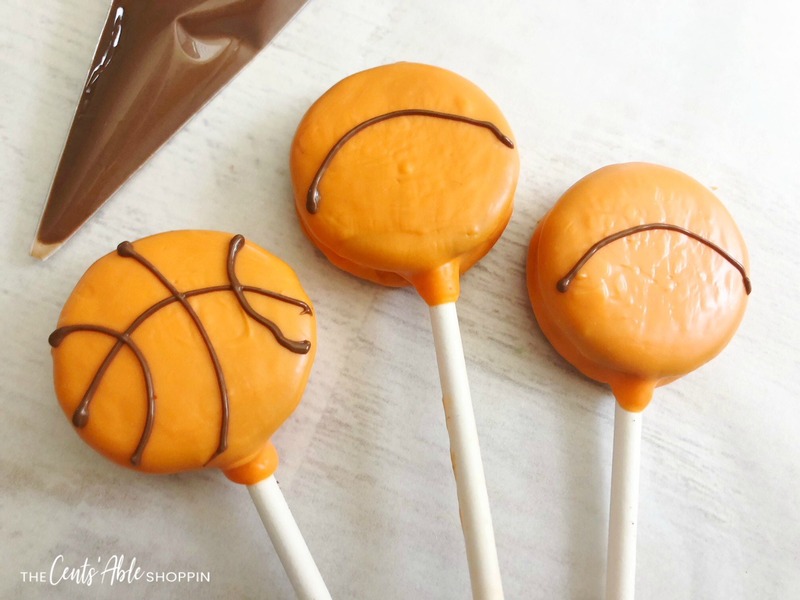 These Basketball Oreo Pops are the best way to celebrate a great basketball season or, to serve for the NBA finals. Be sure to make plenty… they are just as addictive as they are delicious! 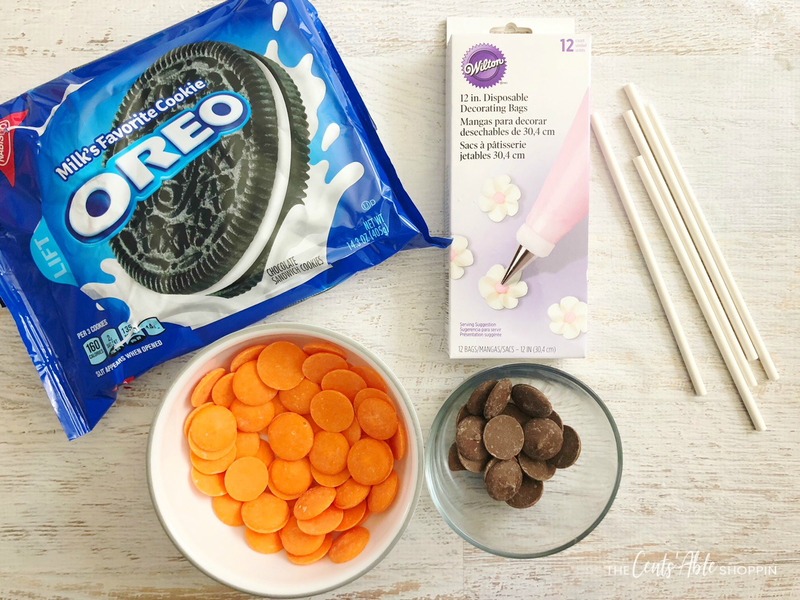 If you are expecting a crowd, pick up a few packs of Oreos and double the orange and brown melts to make sure you have ample to feed hungry bellies. Heat your orange candy melts in a small bowl on 50% power in the microwave for 3-4 minutes, stirring every 30 seconds until melted. Open each Oreo, dip the end of each lollipop stick heavily into the melted chocolate and press your stick carefully into the white filling. Heat your brown candy melts on 50% power for 3-4 minutes, stirring every 30 seconds until melted, pour into a decorating bag and cut a tiny tip off the bottom. Use the melted brown candy decorating bag to draw the basketball lines on, let harden for about 10 minutes.